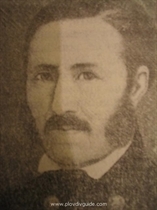 Stanislav Dospevski was the firstborn of Dimiter Zograph's sons. He studied in Plovdiv and helped his father paint the Plovdiv Old Town church of "St. Nedelya". He further studied studied at the Moscow Art School and graduated from the Imperial Academy of Art in Saint Petersburg. He was influenced by the Russian school. One of the first masters of secular portraits in Bulgaria, he applied the techniques of that art to icon-painting, applying oil for the finishing touches of the faces over the traditional tempera. This is the reason why his figures have volume, the form is crisp but the beautiful rosy faces lack the expressiveness of the austere classical icon. Stanislav Dospevski painted icons in the Lopoushna Monastery, Pazardjik region, in Novo Selo near Shtip, in Sevlievo, in the monasteries of Preobrazhenie and Batkoun, in St. Nedelya Church in Sofia (to the order of Ivan Denkooglu), and in the Lovetch church of St. Nedelya - to the order of the Bishop of Lovech Dionisius. Following the April Uprising he was sent to the prison of Constantinople, where he died in 1877.